Here’s another great Christmas craft idea from Disney Family! 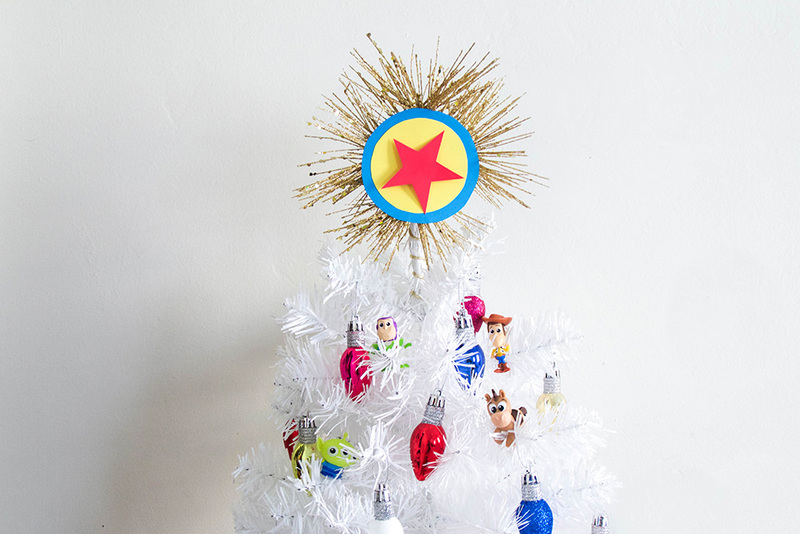 It’s a Toy Story Tree Topper! 1. Start by cutting out a large blue circle and a slightly smaller yellow circle. Use mason jar lids or cups of different sizes to trace out perfect circles! 2. Cut out a red circle just a bit smaller than the yellow circle. Then cut it into a star. Glue all three pieces together to make the Luxo Ball. 3. Choose 4 gold stems to create your starburst. You will need one of them to have a longer stem. 4. Wrap the gold stems together to make a starburst shape. 5. Next, twist floral wire lightly around a pencil to make a spiral. As you remove the pencil, slightly loosen the spiral. Trim off excess wire with wire cutters. 6. Carefully hot glue the spiral stem to the longest gold stem in your starburst. Let dry. Hold in place until completely set. 7. Glue the Luxo Ball onto the center of the starburst. Once set, place on top of your tree! *photo and directions courtesy of Disney Family!